Most graphic cards today pull a good two to three hundred watts while under load, and if you have two of these, then your current power supply might not be adequate. Instead of going out and purchasing a thousand watt or higher power supply, which can be very pricey, Thermaltake has introduced an add-on power supply called the Thermaltake ToughPower Power Express VGA 650Watt which slides directly into two of your 5.25" drive bays. 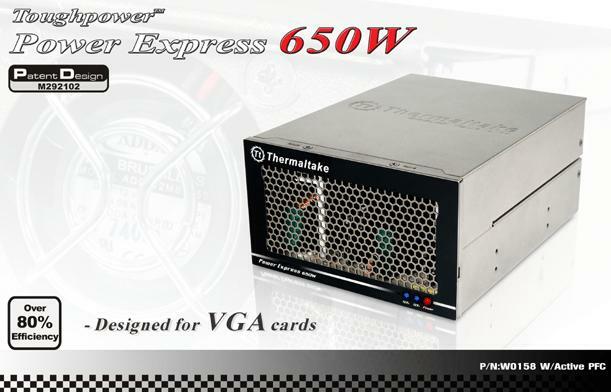 With a maximum power output of 650 watts, this thing can handle two of the most power hungry cards on the market today. Thermaltake, the market’s most trusted brand name also produces the market’s most reliable Toughpower series power supply. Built with the latest technological advances in circuitry design with industrial-grade components, Toughpower offers industry’s leading 87%+ efficiency, power protection and performance that today’s cutting-edge PC components demand. Recognized for its highest level of performance, Toughpower power supply carries either Nvidia SLI Ready or AMD/ATI CrossFire certification that fully supports Nvidia 2-way and 3-way SLI configuration as well as AMD/ATI 2-way, 3-way and 4-way CrossFire configuration.